Welcome to Teaser Tuesdays – a weekly feature hosted by A Daily Rhythm. From the beginning of December to the end of January, Books by Proxy will be taking part in The 2016 Sci-Fi Experience, hosted by Stainless Steel Droppings. Expect a new teaser every week! 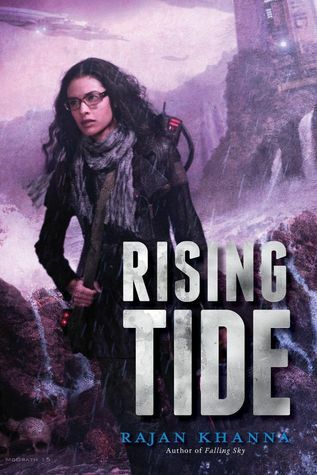 Falling Sky first came to my attention after reading the synopsis for its sequel, Rising Tide. With its backdrop of a post-apocalyptic Earth teaming with terrifying Ferals, glorious airships and cities in the sky, this is a novel which had me hooked with anticipation alone. And it didn’t disappoint. 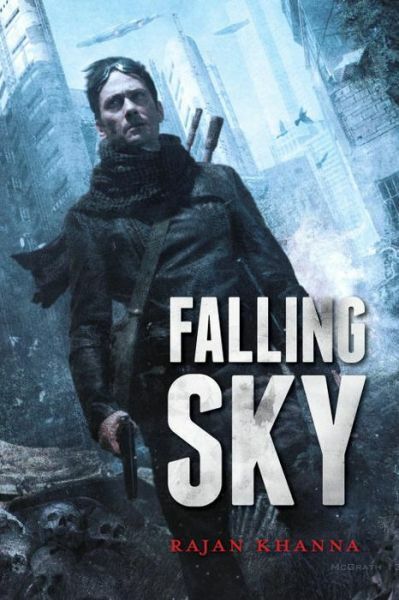 Falling Sky is a new and exciting interpretation of the post-apocalyptic zombie genre which, though short, remains a fast-paced and action filled debut whose climactic conclusion left me reaching for the next book. Ben, a lone wolf, has reluctantly agreed to use his skills and his airship to help an idealist scientist, Miranda, on her search for a cure. Protecting her from Ferals is dangerous enough but when power-mad raiders run rampant, Ben finds himself in the most dangerous place of all—the ground. Ben’s journey leads him to Gastown, a city in the air recently conquered by belligerent and expansionist pirates. Old friends and new enemies are drawn into a struggle that quickly becomes a fight for the fate of the world. Ben must decide to focus on his own survival or risk it all on a desperate chance for a better future. Falling Sky follows the story of Ben Gold – a gun-wielding, Feral-fighting airship captain – who finds himself the protector of a colony of scientists, and Miranda in particular, at the small research town of Apple Pi. Except this is a world of vicious Ferals who roam the earth and barbarian raiders and hostile townships who patrol the skies. Ferals kill indiscriminately and the bandit states revel in pillage and plunder, actively seeking the destruction of others. Once under their radar, no one is safe… and for Apple Pi time is running out. Ben and Miranda must set off on an adventure which takes them into the heart of the piratical state as Miranda attempts to continue her search for a cure to the Feral plague and Ben does all he can to help Miranda, and himself, survive. Khanna has creating a terrifying and enthralling world where the beauty and wonder of life aboard airships and on sky towns is contrasted with the destruction of the human race and the unstoppable spread of the virus which turns humans into Ferals. Thematically I loved this book, and in particular the wonderful depiction of the warmongering bandit states -Valhalla and Gastown. Khanna has fashioned a world where airships and, quite literal, townships vie for supremacy over a ruined and overrun world; where life on the ground is undeniably dangerous, and where carving out an honest existence in a world of cruelty and selfish greed is an incredible hardship. It is through the voice of the narrator, Ben Gold, that a true sense of this hardship is made apparent. Ben is an interesting protagonist whose rough and ready approach makes for a fast-paced and exciting read, his life and history unfolding unobtrusively as the narrative progresses. However, whilst enjoyable throughout, Ben’s voice failed to captivate me as much as it ought to and I became keenly aware that I would prefer to read this book in a third person perspective, in order to convey more of the post-apocalyptic landscape. This, as always, is subjective and whilst Ben might not be the man for me, he played an excellent counterpoise to the scientists of the novel who are almost in a world of their own with their singular, and sometimes dangerous, determination. Khanna also fields a host of other characters full of charm, wit and gun-toting reflexes; in particular Diego and Rosie, who convey a sense of strength and solidity in a fragile world, and Claudia, who all became firm favourites over the course of the novel. Falling Sky is a thoroughly exciting read set in a brilliantly realised world, whose climactic conclusion had me reaching for the next book. Khanna has succeeded in creating a dynamic tale which is constantly moving forward (even when looking backwards) and practically brims with action on every page. This is a novel which surprised me with its world and storyline, left me a little wanting where the protagonist was concerned, yet surprised me again with its cliffhanger ending. In short – a very enjoyable read. If you want to read a novel about a terrifying post-apocalyptic world where lives are carved from the ruined remnants of society, and life is truly experienced in the airships of the sky, then this might just be the read for you. Whilst by no means perfect, Falling Sky remains an exciting and enjoyable read, has satisfied my zombie cravings, and has introduced an author who I certainly intend to read far more of in the near future. Music, much like literature, has the power to drive your imagination; it can lift the soul and create real emotion. This is Bookish Beats, a feature which will showcase some of the soundtracks which have enriched the worlds I’ve found between the pages. The Ex Machina soundtrack is pure atmospheric ambience. Created by Ben Salisbury and Portishead’s Geoff Barrow, this is a soundtrack which celebrates electronic music; transporting you to another time, another place… and maybe even another world. Dark electronic synths fall across a backdrop of moody reverberating tension to create a score which could only have emerged as a result of pure science fiction inspiration, and which succeeds in creating an incredibly evocative backdrop for reading any science fiction thriller. The Ex Machina soundtrack is subtle and understated yet retains a flair for the dramatic that excites, ripples with tension and keeps the button pressed firmly on repeat. From the opening track – The Turing Test which, with its distinctive combination of a rolling and beating melody interwoven with dark electronic synths, introduces one of the soundtrack’s main themes – this soundtrack establishes an unyielding atmosphere which remains undiluted throughout the entire score. Watching continues this ambient theme but is overlaid with an electronic beat which slowly transforms into a beautiful creeping melody before disappearing beneath a cloud of tension, cut through with a low and wavering bass. Ava is an entirely different type of track. There is a certain innocence which permeates the background of tension and the melody is reminiscent of the tune from a musical jewellery box. This same melody is echoed in other tracks such as The Test Worked, a piece which is saturated in gentle ambience until the score’s other main theme – a rousing and repeating electronic melody – cuts in. Skin also features echoes of this ‘jewellery box’ theme before transforming and intensifying until the gentle beat becomes a pounding, climactic finale. Out, which is one of the score’s stand-out tracks, plays with this same gentle tone but transforms it into fast-paced and melodic electronic number. Falling is an incredibly beautiful track which is a combination of atmosphere, gentle melodies and intensifying tension which reaches a pounding and dramatic climax. This tension is an essential characteristic of the entire soundtrack and, in tracks such as Hacking / Cutting and I Am Become Death, is intensified and entwined with ambience, rhythmic beats and almost discordant sections, which gradually build the pace until cutting out to a whining reverberating chord. Bunsen Burner, a track by Cuts, uses the score’s electronic theme to create a tense and sweeping action track which creates a triumphant finale to phenomenal score. This is a soundtrack which impresses with its subtle drama and tense atmosphere. If you’re looking for an ambient soundtrack which echoes the character of a moody science fiction thriller, then Ex Machina may just be the perfect score. My impromptu novella season continues with Alastair Reynold’s great new sci-fi short, Slow Bullets. Having never read any work by Reynolds, Slow Bullets seemed like the perfect opportunity to dip my toe in the water and get a taste of what this prolific author is all about. This is a novella which reads like a memoir, has all the vision of a science fiction epic, and is crammed full of mystery and danger, leaving me in more than a little need of another Reynolds fix. Slow Bullets follows the story of Scur, a soldier forced into service who, after a tortuous and almost fatal encounter with the enemy, awakens to find herself on a prison ship which by all appearances is adrift in space. Scur is not alone. Hundreds of detainees, soldiers who fought on both sides of the war, and crew members are waking up to an atmosphere of confusion, rivalry and tension to find that their ship may be little more than a glorified tomb. And time is running out. 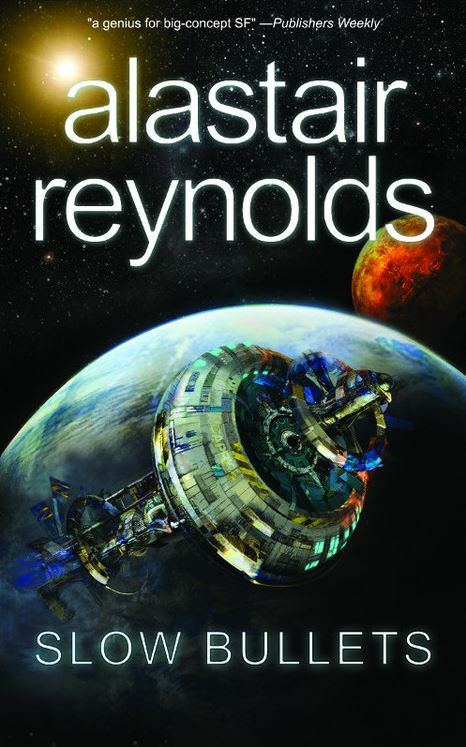 In one short story, Reynolds manages to create a universe saturated with history; wars, conflict and religious feuds have had an indelible effect on the lives of those on board ship, and culture is made apparent through snippets of art and poetry which permeate the narrative. Slow Bullets stays clear of the hard science and presents a tense and plausible situation with little straying from the main narrative, spurring on the action and allowing the tale to unfold. This is a short, sharp and exciting read which appears to have a whole novel lurking beyond its pages. Scur is perhaps not the most likeable of characters and although I sympathised with her situation, her hard edges barely weathered over the course of the narrative. She does however have a sense of realism in line with her situation which makes her a very convincing character to read. The multitude of side characters seemed almost like passing acquaintances by comparison, inspiring little in the way of emotional connection – though perhaps this is a reflection of Scur as narrator. However, this lack of connection allows for an element of mystery and intrigue to saturate the narrative and ultimately cast Scur in a more favourable light. 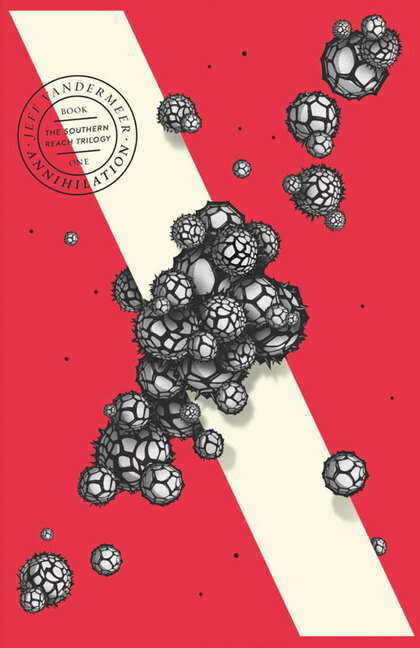 Alastair Reynolds has certainly proven himself to be a skilled storyteller; his writing manages to conjure up almost an entire Universe in surprisingly few pages and I was hooked from start to finish. I would perhaps have preferred a more climactic and action packed conclusion – this novella certainly has the potential to be a full-length novel – but the conclusion was ultimately satisfying and the writing was fast-paced and exciting throughout. If you’re looking for an exciting and suspenseful science-fiction novella to slot into the busy holiday season then Slow Bullets is an excellent place to start. This might have been my first foray into the writings of Alastair Reynolds, but it certainly won’t be my last! Welcome back to another week of Bookish Beats. We’ve had a little break from this feature whilst I attempt to organise myself but this week we’re back with a vengence with the Oblivion OST. This soundtrack is the result of a phenomenal collaboration between director Joseph Kosinski and the French electronic group M83. Following the success of the Tron Legacy soundtrack, in which Kosinski drafted in Daft Punk to create the score, the Oblivion director again went down the alternative route and selected M83 to score the soundtrack alongside Joseph Trapanese. M83 have succeeded in creating a powerfully tense and mesmerising score which compliments the movie whilst being a stunning album in its own right. With nods to traditional classically composed soundtracks, M83 have created an electronic symphony which flows effortlessly from one track to another and provides the perfect backdrop to any science fiction novel. Opening up with Jack’s Dream, a short piece which feels at home in a science fiction epic – grand, slow and powerful – and flowing on to Waking Up, a brilliant, slow building track which introduces the main theme present throughout the OST; this soundtrack builds to fantastic heights and provides a full complement of tracks for action, for atmosphere and tension, and for haunting emotive scenes. Atmospheric tension is a common theme throughout this soundtrack where discordant sounds and repetitive beats create pieces which wouldn’t be out of place on a game soundtrack. Tech 49, Odyssey Rescue and Losing Control are all slow building, tense tracks which reach powerful and often haunting crescendos, Radiation Zone uses elements from the main theme and overlays it with a powerful drum solo, and Temples of Our Gods uses choral pieces to give a tense track an element of grandeur. The Oblivion OST also presents a number of impressive action tracks with Earth 2077, which weaves an electronic theme throughout this epic and all encompassing symphonic number, and Canyon Battle, a similarly tense and powerful action track which uses electronic synth melodies to get your heart pumping and succeeds in creating one of the best action tracks I’ve heard in a long while. But this soundtrack is not without its truly haunting an emotive pieces either. You Can’t Save Her, Raven Rock, Starwaves are all incredibly beautiful and emotive tracks, and Ashes of Our Fathers, Undimmed by Time, Unbound by Death, I’m Sending You Away and Fearful Odds are all downbeat chillout numbers which use haunting renditions of the main theme to create a perfect combination of tension and emotion. Something which is similarly found in the final track of the album, Oblivion, performed by Norwegian singer-songwriter Susanne Sundfør. 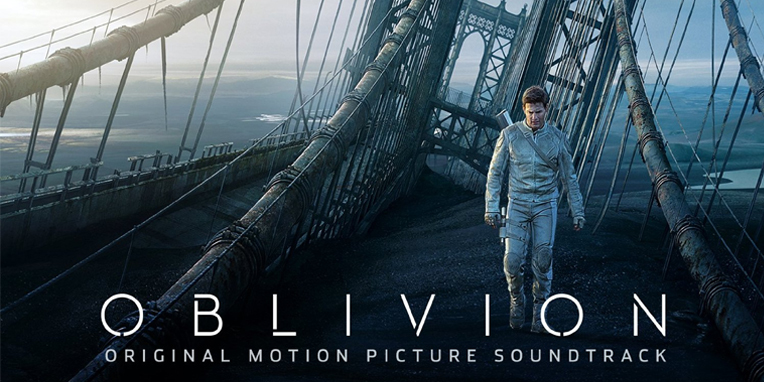 If you’re looking for a soundtrack to a science fiction epic then you could do much worse than the Oblivion OST. The electronic overlays give it a true science fiction feeling making it the perfect backdrop to a good book. 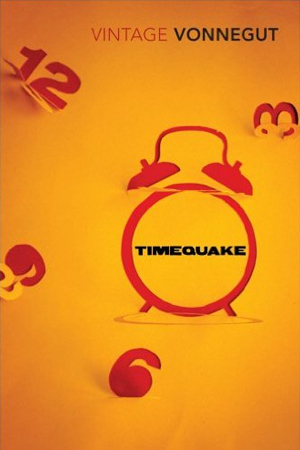 According to science-fiction writer Kilgore Trout, a global timequake will occur in New York City on 13th February 2001. It is the moment when the universe suffers a crisis of conscience. Should it expand or make a great big bang? It decides to wind the clock back a decade to 1991, making everyone in the world endure ten years of deja-vu and a total loss of free will – not to mention the torture of reliving every nanosecond of one of the tawdiest and most hollow decades. With his trademark wicked wit, Vonnegut addresses memory, suicide, the Great Depression, the loss of American eloquence, and the obsolescent thrill of reading books. 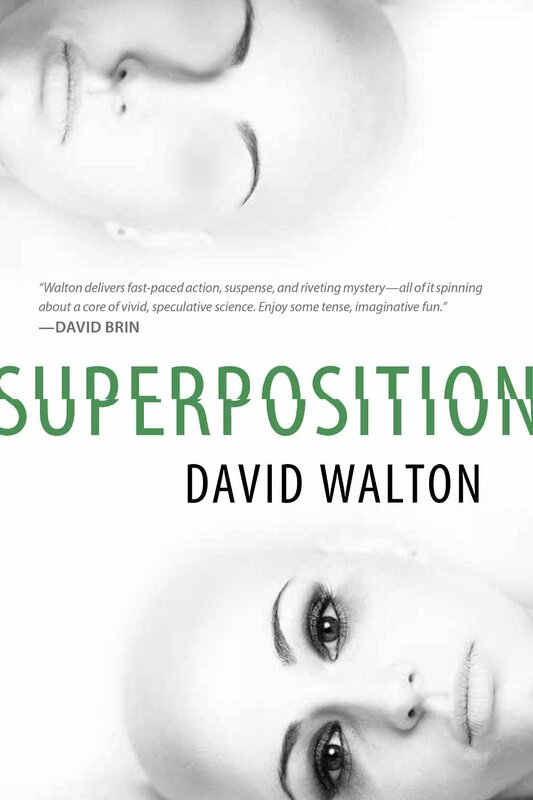 After reading numerous excellent reviews for Superposition and hearing excellent things about David Walton’s writing, I snapped up the chance to read and review Superposition when it was presented. I love science fiction. I love crime thrillers. So I’m willing to bet that I sure as hell am going to love a combination of the two. And Superposition really didn’t disappoint. This is a fast paced sci-fi thriller which unfolds like a crime drama. Completely unpredictable – anything could and does happen – and utterly absorbing, David Walton has created a world which makes you think, makes you dream and makes you believe. Jacob Kelley’s family is turned upside down when an old friend turns up, waving a gun and babbling about an alien quantum intelligence. The mystery deepens when the friend is found dead in an underground bunker…apparently murdered the night before he appeared at Jacob’s house. Jacob is arrested for the murder and put on trial. Jacob Kelley life is changed irrevocably when an old friend and colleague shows up at his house presumably deranged and spouting wild scientific theories. When events escalate and the impossible starts to happen, Jacob realises that Brian’s theories may not be so wild after all. Only Brian has been murdered and Jacob is the number one suspect. On trial for a murder he couldn’t possibly have committed, and on the run from an alien quantum intelligence which seems intent on hunting him down, Jacob must find a way to prove his innocence before it’s too late for both himself and his family. Walton writes a highly convincing plot, fast paced and brimming with tension. The narrative twists and turns and keeps you guessing until the very end – and for this sci-fi crime thriller, absolutely anything is possible. The narrative is split into two through the ‘Up-Spin’ and the ‘Down-Spin’ chapters which separate the past from the present – the events which led from the opening scenes from the murder trial itself – which gives breathing space to the action, keeps the pages turning and provides two fascinating perspectives on these impossible events from one man who is completely out of his depth. The science behind Superposition is conveyed excellently throughout the murder trial. Walton relies on the testimonies of expert witnesses to explain the science in layman’s terms without having to resort to lengthy information dumps which would have broken the tension and pace of the novel. This is hard sci-fi, there’s no getting away from that (if it’s the sort of thing that puts you off), but the narrative is so compelling and draws you in so completely that the scientific details are unlikely to overwhelm even the biggest sceptic of hard sci-fi. Jacob Kelley is a convincing narrator whose alternating chapters from past to present give a sympathetic view of his character. The characterisation was also perfect for this style of novel. Where usually I prefer a certain amount of depth to all characters, the depiction of the bit players fell in line with what I’ve come to expect from crime novels where the protagonist is fleshed out fully but the side characters are open to all possibilities – and all can be suspected. This helped to keep the focus on both the protagonist and the action, and aided in making the surprises even more surprising. Superposition is a fascinating, exhilarating and truly absorbing read which left me wanting more. Recommended to all fans of science fiction – expect wild scientific theories, surprises aplenty and heart-thumping tension from a sophisticated sci-fi thriller. David Walton is certainly an author I will be keeping an eye on. Ben Gold sacrificed his ship in an effort to prevent pirates from attacking the hidden city of Tamoanchan. Now Malik, an old friend turned enemy, has captured Ben and Miranda—the scientist Ben loves. With Miranda held hostage, Ben has to do Malik’s dirty work. Miranda has plans of her own, though. She has developed a test for the virus that turned most of the population into little more than beasts called Ferals two generations ago. She needs Ben’s help to rescue a group of her colleagues to perfect the test—but first they must rescue themselves. When a terrible new disease starts spreading across Tamoanchan and people start dying, it seems there’s something more sinister afoot. Then an old enemy attacks. Can Ben fight off the invaders? And will it be in time to save anyone from the disease?